Our Galaxy is not alone. The Universe is filled with hundreds of millions of galaxies, in all shapes and sizes. Most galaxies float together in a group, or cluster, on an island of dark matter. These clusters cling to each other in superclusters that are forced apart by the expansion of the Universe caused by its birth, the Big Bang. In the 1990s, Big Bang mathematics called for the Universe to expand until its mass overcame its energy, and it then it should slow down. So, astronomers tried to look back far enough in time (by looking deeper into the Universe where light from the past was still trying to reach us) to clock the expansion history, to see if they could measure the Universe’s deceleration. They used what we call a “standard candle,” a bright event that unfolds exactly the same way every time. It is called a Type Ia supernova, and it’s the explosion of material off a violent implosion of a star. Two teams of astronomers, led by Saul Perlmutter in California and Brian Schmidt in Australia, found the same result: the supernovae were too dim at the distances they were supposed to be. Too dim for a standard candle means the distance is wrong, and the candle is actually farther away than they thought. But to be farther away, then the Universe was not expanding the way the Big Bang mathematics said it should be. Instead, the Universe expanded slowly in its early years, but that expansion has increased over time. A kind of unseen, repulsive energy is pushing apart the structures of the Universe. It was called “Dark Energy,” and its proposal was highly controversial. Ironically, Einstein’s 1917 pre-Big Bang mathematics had included a “cosmological constant,” a factor of expansion that helped his calculations of the fabric of space and time make sense. He had abandoned that constant when Hubble’s results were revealed a few years later. 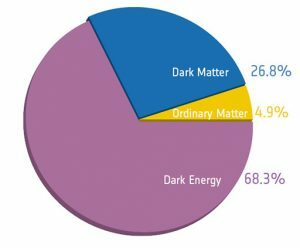 Now, with so many follow-up observations confirming its existence, Dark Energy is has become the largest factor in the equations that may govern the Universe. Perlmutter and Schmidt won the Nobel Prize for their discovery. Radio telescopes have become the major tool in mapping the effects of Dark Energy across the Universe. The VLBA, in particular, can detect natural lasers, called masers, in very distant galaxies and use them as standard candles to clock expansion rates to high precision. Specialized receivers on the GBT have recently given it the power to measure redshifts of very distant galaxies to high precision. We can begin to assemble a 3-D map of the galaxies in the Universe that translates to a structural diagram of the Universe. A companion project uses the GBT’s sensitivity to map the brightness of hydrogen in large volumes of space, preparing a kind of cosmic web of unseen matter to weave among the seen galaxies. Cosmologists interpret the signatures of the Universe’s mechanics, the mysterious dark energy of its expansion and the dark matter of its galaxy-building, by comparing these data.